Its been at least two years now that I have been trying to buy the farm Goedmoedsfontien. Its a 10 Hectare property near Coleen Glen about 20km from Port Elizabeth. The land is on the base of a south facing hill. The remaining part of the original farm from which other parts have been subdivided over the years. Parts of the house are really old. The farm was first granted to a Mr Kok in 1816. He may have built this house shortly after that. I am still doing some research to find out with certainty. The farm has some pasture some forest and some wet land. There are two springs and a stream running though the property. The two streams I believe feed the Kragga Kamma river after which the area is named. My intention is to restore the farm into a mixed farm with indigenous Nguni cattle, boerbok goats and local sheep breeds. I intend to manage the forest and perhaps run a small free range pork operation. I have some experience with pastured poultry. the farm will definitely be suited to this. Right now the farm is overrun with invasive alien trees and I have started to work of clearing these. The farmhouse is not yet accessible by car and I am building a new route from the road about 200 m from to the house. Its is very sensitive work as the road has to cross the stream that runs from the spring. There are number of beautiful indigenous forest trees that the driveway must avoid. This too adds to the complexity. The cottage has been abandoned for many years and needs a lot of hands on work restoring it the roof needs to be replaced along with windows doors and floor boards. Some of th walls are of mud brick construction and need a careful and caring approach to restore them. I have now secured an “option” to purchase the farm by September 2013. I have had to pay for the option so I am risking quite a bit of cash. The reason I cannot buy the farm without the option is because the banks will not offer finance on “vacant land”. 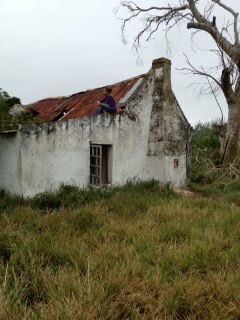 The house is really in a bad state and I intend to spend the next months fixing up the house and the farm to the point where we are able to convince the banks to provide finance. So this is my mission for the next six months. I am going to need all the help I can get to save the farm and save me from loosing what I have put in. I am now actively calling for volunteers to assist.